Code général des impôts directs et taxes assimilées : text intégral des lois, décrets, décrets-lois, décret de codification, suivi d’un formulaire administratif. Paris: Editions Litteraires et Artistiques/Librairie “Le Triptyque”, 1944. The General Code of Direct Taxes and Related Taxes: Full text of laws, decrees, decree-laws, decree of codification, followed by an administrative form contains national, regional, and local tax laws of France, divided into three sections. Bringing levity to the Code are 183 illustrations ranging from small drawings at each chapter heading to a four-page illustration. The small illustrations depict specific code provisions with humor and whimsy. 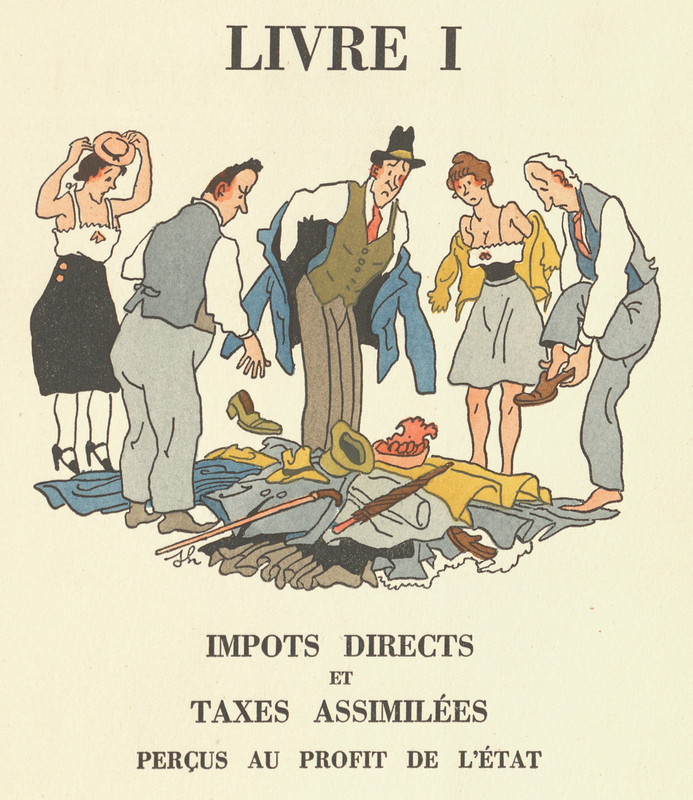 In the four-page illustration, five citizens gradually lose more garments until the last illustration features the citizens naked, with a winged tax collector holding a pile of clothing. This work was published February 15, 1944 and printed by E. Desfossés in Paris. Hémard’s illustrations were stenciled by coloriste E. Charpentier. Eight hundred copies were printed, of which Tarlton owns no. 212. Joseph Hémard (August 2, 1880-August 9, 1961) was a French artist and illustrator well-known for his clever and risqué drawings. He sold his first drawings to the French magazine Le Pêle-Mêle in 1899 and illustrated his first book in 1914, Contes Chaloupés by Pierre Thibault. From 1914 to 1918, Hémard was held as a prisoner of war in Gustrow, Germany. 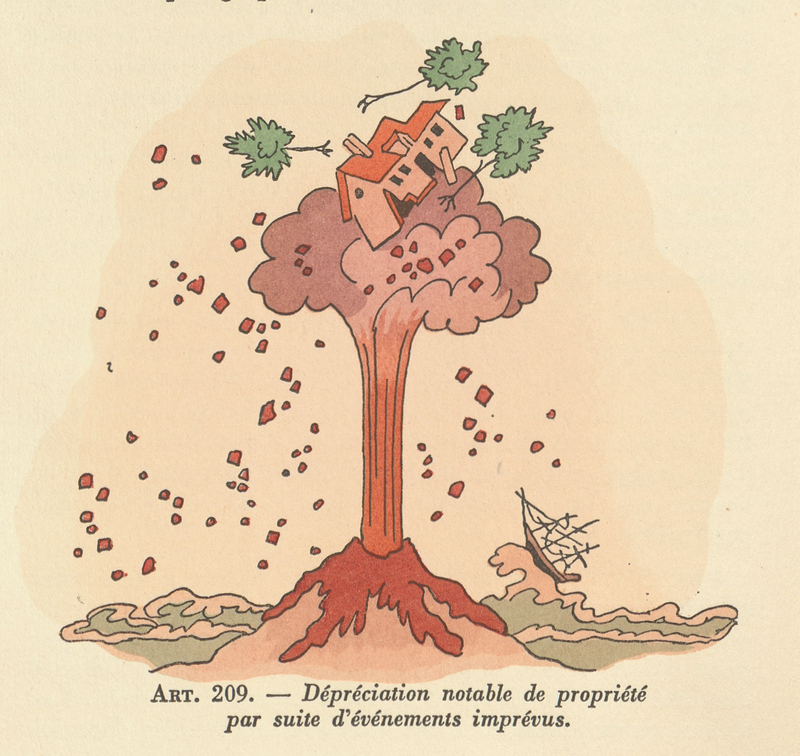 He published Chez les Fritz: Notes et croquis de captivité in 1919 about his experience. 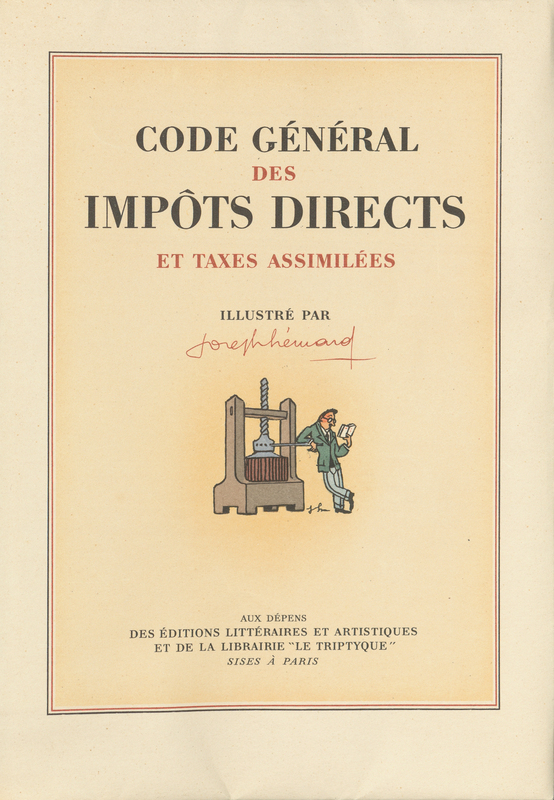 In addition to his illustrated General Code of Direct Taxes and Related Taxes, Hémard illustrated two other law books – Code civil. Livre premier, Des personnes (1925) and Code Penal (192u). He also illustrated classics of French literature by authors such as Balzac, Molière, Rabelais, La Fontaine and Voltaire. His illustrations grace a pharmaceutical manual (Le Formulaire Magistral, 1927), promotional booklets for the French National Lottery, and Brillat-Savarin’s work on gastronomy (La Physiologie du Goût, 1947). He wrote and illustrated his own works as well, including a children’s history of France and grammar, history, and arithmetic textbooks. French for “stencil,” pochoir is a technique for hand coloring or hand illustration that produces fine, limited edition stencil prints. The process is characterized by crisp lines, brilliant colors, and a freshly printed or wet appearance. Numerous stencils are created as a way of reproducing an image. A découpeur would cut stencils, originally made of aluminum, copper, or zinc and later celluloid or plastic. The stencils were then given to coloristes to apply pigment, typically watercolor or gouache (an opaque water-based ink), to each layer. Pochior was popular in the late 19th century through the 1930s with its center of activity in Paris. The style is frequently associated with Art Nouveau and Art Deco. In addition to this book, the Tarlton Law Library's rare books collection includes Hémard's other illustrated law books, Code civil. Livre premier, Des personnes and Code Penal, as well as his illustrated autobiography published in 1929.